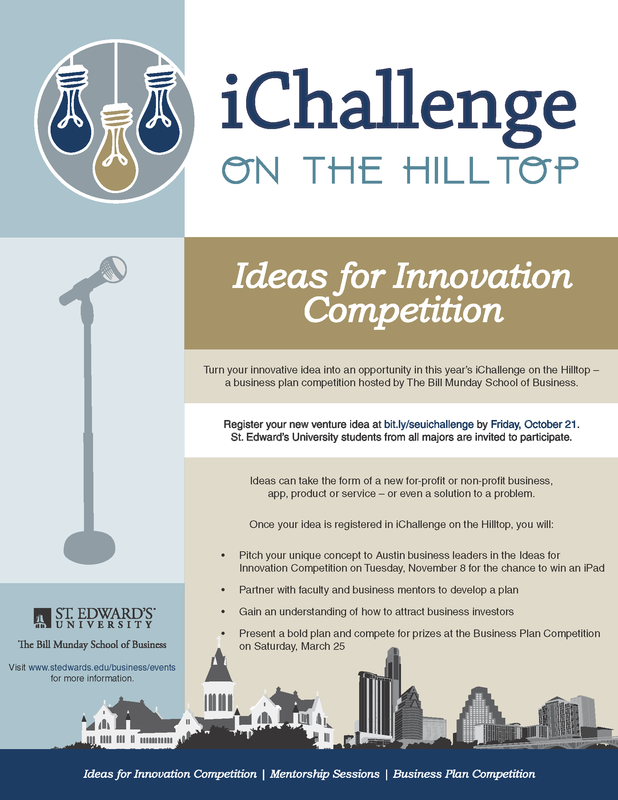 Here’s some info on this year’s iChallenge on the Hilltop – the Munday School of Business pitch and business plan competition. The deadline to register new venture idea is Friday, October 21. Students must submit an application at http://bit.ly/seuichallenge to be able to participate in the competition. We invite students from all majors with innovative concepts to compete. Additional details on the competition is available on our website at www.stedwards.edu/business/events. For more info, see the attached flyer or this short video with students: https://www.youtube.com/watch?v=3Qp428qIW40&feature=youtu.be. This entry was posted in Student News and tagged business plan, competition, iChallenge, innovation, MSB, Munday School of Business by Gary Morris. Bookmark the permalink.